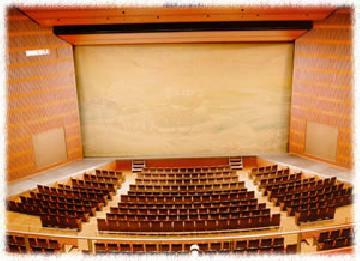 This proscenium style hall of distinguished theater space with a wood grain finish floor is most suitable for stage art such as concerts, performances, musicals, and dances, as well as ceremonies and lectures. 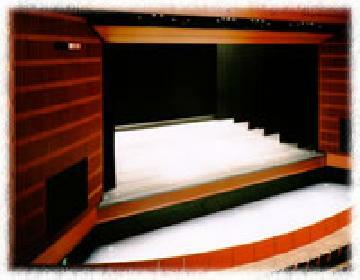 Furthermore, seats are arranged to surround the stage in a circle to create a warm and soft atmosphere. While maintaining the atmosphere of the ancient days, Chiryu City moves forward toward “an active green town of interaction.” The design of the stage curtain brings a new sense that matches the hall that symbolizes Chiryu City that is taking big strides into the 21st century. Furthermore, the weight of the fabric that is woven with textural variations of bold impressions and ridges reveals interesting expressions through changes of light or when viewed from different angles. The moving acoustical cloud conveys the sound generated from the stage to the audience seats evenly in a manner in which the proscenium wall and acoustical cloud are combined into one, and it gives the best acoustic conditions at all times. In addition, making a lift-type orchestra pit as the front stage enables various types of stages. Accompanying people can also have seats and enjoy performances, not to mention families with small children. * Hanging feature is electric counter weight system, and controlled by computer. * The floor feature of the movable front stage for orchestra can be lifted to the orchestra pit.